What’s It About? Even with Halloween gone for another year, there’s still a host of Horror releases out there to sink your teeth into. The dark and macabre isn’t just for one night a year after all! If you’re still looking for that thrill then Arrow Video have once again stepped up with a classic to devour – The People Under The Stairs. When you mention Wes Craven, every horror movie fanatic knows about his rich history in the genre. From A Nightmare on Elm Street to the infamous Last House On The Left, Craven is one of the masters of horror and knows how to play an audience. The People Under The Stairs was made in the early 90s nearly twenty years after Last House. Taking the roles of director, producer and writer on this particular project, Craven was certainly hands-on in trying to push his ideas of terror. As you’d expect from the title, the focus is on a local house that no one goes near because of the creepy family that live there and rumours of something far darker. Of course being a horror movie, people will always go where they’re not meant to. Fool (Brandon Quintin Adams), Leroy (Ving Rhames) and Spenser (Jeremy Roberts) are these people, and try to rob the house to fund medical care for Fool’s mother. What they find there is unexpected, mysterious, hilarious and downright bloody in places. 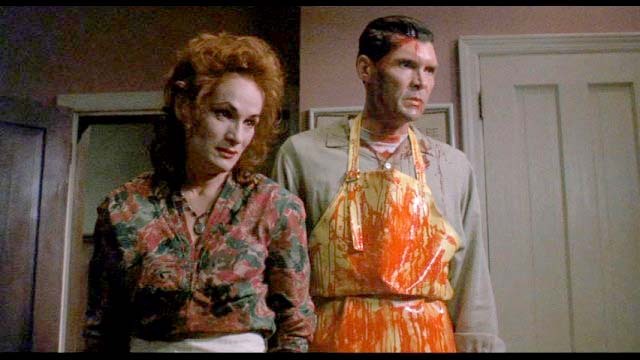 The Robesons – Mommy (Wendy Robie) and Daddy (Everett McGill) – live in the house with their daughter Alice (A. J. Langer). Stranger than the average family, when they discover the gang they lash out. Throughout the movie we witness their fear of the outside world, their struggles as a family raising a daughter, and family difficulties dealing with the intruders. Much like The Texas Chainsaw Massacre, here is a bizarre collective with their own secrets that certainly don’t fit into normal society. As the tale unfolds, you’ll find your sympathies challenged from one character to the next, and a real sense of fear and sorrow combined. Verdict: As with many of Craven’s works, The People Under The Stairs falls somewhere between comedy and horror. While terrifying in many ways, there’s often a laugh to be found, much like Freddy Krueger on Elm Street known as much for his wise cracking ways as his murders. For those who like social commentary in their horror like Romero’s Dead movies, there are hidden depths here and if you scratch the surface Craven had a lot to say about politics at the time. This is a movie where it’s up to you to decide what you want to get from it. If you want a horror you can laugh your way through then it works perfectly, yet if you want a more intelligent and aware movie then there are plenty of ideas to examine further. While not one of the best 90s horror movies, or even one of Craven’s best, The People Under The Stairs still has enough good ideas to make it an enjoyable addition to any horror collection. It’s well worth a watch if you’ve never seen it before, and it is by far the best presentation of the movie available for home viewing. Extras: Arrow never let fans down and here we’re treated to an audio commentary from Adams, a discussion about the themes of the movie by Craven, and a number of other featurettes. It’s perhaps only through these extras that you truly discover how good The People Under The Stairs actually is, and the thoughts that went into putting the movie together. This is another impressive effort from Arrow including a trailer, collector’s booklet and reversible sleeve as well. Final Words: Don’t mistake the dark humour of The People Under The Stairs for making light of the savage nature of what Craven wants the audience to see. Beyond the occasional cheap laugh and strange character is a broken family unit, analysis of the class system, and so much more. This is certainly a movie for scholars to pick apart and learn from, as well as one that casual fans can enjoy. It’s forgotten by many, underrated by most, but this new High Definition release brings it to the forefront again and to a whole new generation, and deservedly so. The transfer isn’t perfect but truthfully The People Under The Stairs is a movie that speaks for itself. It doesn’t exist to wow on a spectacular visual level. Instead it relies on the tension created by the environment and the twisted nature of the characters. A modern day fairy tale of suspense and the peculiar, The People Under The Stairs is like no other. Expect to be scared, amused and completely baffled all at the same time. 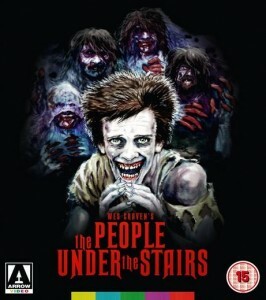 The People Under The Stairs is out on Blu-ray now.